Water. Without it, we can’t survive. With it? Well, when we’re drinking it, quality is key. When we’re hunkering down during a hurricane, quantity keeps us alert. During a drought, availability tops the list. Enter professional hydrologic technicians, whose job it is to monitor, record and analyze virtually every aspect of water and how it affects our world. 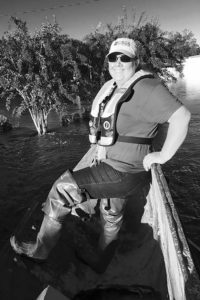 In her position as a hydrologic technician for US Geological Survey (USGS), Kendra Smith (’08, Marine Science) has been doing that very thing for the past decade. 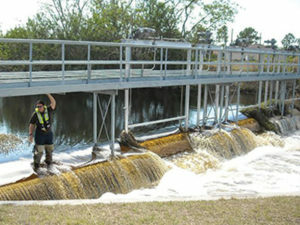 Two months after her graduation, she secured a position in USGS’s Fort Myers office. Today, she works out of Columbia, S.C., collecting the data that scientists rely on to keep us safe. Smith transferred to FGCU for her junior and senior years, after having attended two other colleges which, she says, did not motivate, or inspire her.